SAN DIEGO, Calif. (CBS 8) - On Wednesday, Animal Control officer shut down an illegal kennel in Lakeside. The final count tallied 63 dogs living in crates in a two-bedroom home. News 8 followed the dogs to the county animal shelter, where veterinarians are treating them for a variety of medical problems before they can be adopted into new homes. Surrounded by laughter, a little Chihuahua is getting spa-like treatment fit for a queen. Jennifer Mengers says 63 dogs in all need her help, starting with a boxer that will have six ticks pulled out of its ears. "I do my job because I love animals. That's exactly why I got into what I do," Mengers said. Animal Control officer seized the dogs from an illegal kennel in Lakeside. "No one person can take care of 60 dogs,"
Alica Via, 65, was arrested and charged with animal neglect. She's accused of keeping the dogs in crates 23 hours a day. "She got in way over her head. I'm not going to dispute the fact that she loves dogs," Lt. Dan Desouza said. Lieutenant Desouza says Via told investigators some dogs hadn't been to a vet in years. "They need medical attention. We are providing it to them already," Lt. DeSouza said. Medicated baths, injections and antibiotics will soon cure their mange. 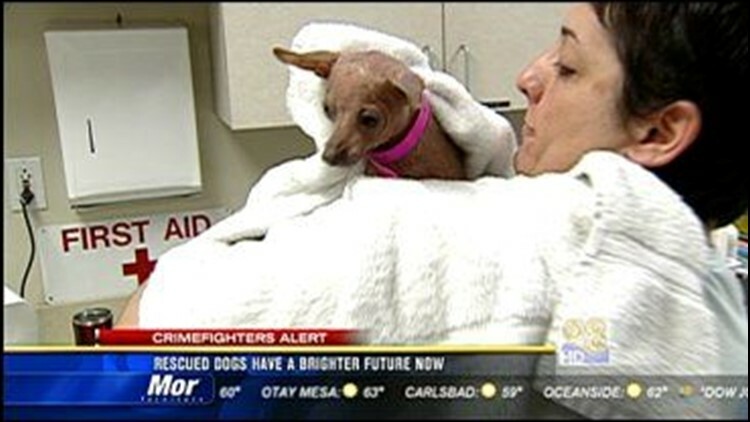 "Their hair is going to grow back and they will become your happy little Chihuahua," Lt. DeSouza said. As for the boxers and puppies, they're drinking all they can. Officers suspect the dogs were deprived water at the kennel to prevent them from urinating in their crates. The dogs now have beds, pillows and pampering 24/7. "There is a tremendous amount of hope," Lt. DeSouza said. But in a few weeks, the white towel treatment ends and the dogs will need new homes. "The public is going to have to step up and say yeah, I can take one of these dogs home and give it a loving home," Lt. DeSouza said. Once these dogs are nursed back to health, the county will issue a news release to the public so that families can step forward and adopt the dogs on a first-come, first-serve basis.